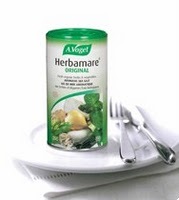 I personally have never heard of Herbamare, but Anne and Marc-Andre here have, and apparently they are a recognized brand here in Canada for sea salt. They have been serving up salt for decades and are stocked in many of our kitchen cupboards. But it looks like they are on a promotion drive which is great for us freebie hunters as we can now claim a free Herbamare sample. In conjunction with this freebie, you can also sign up for a free Healthy Ways magazine subscription.